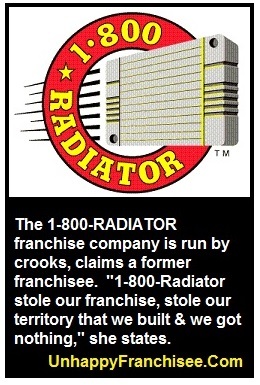 The 1-800-Radiator & AC franchise company “are crooks and they have forced us into bankruptcy,” according to an angry former franchisees. (UnhappyFranchisee.Com) “1-800 Radiator stole our franchise, stole our territory that we built, and we got nothing,” writes LuAna C. Plonski, who bought a 1-800-Radiator franchise with her husband Tobias. Ms. Plonski contends that investing in a 1-800 Radiator cost her more than $250,000 and landed them in bankruptcy. Public records indicate that the Plonski’s lost their home to a bank foreclosure. The home was recently sold at a public auction. LuAna Plonski contends that after opening, the 1-800-Radiator franchisor, Radiator Express Warehouse, Inc. from Benicia, CA, undermined their business with outrageous fees and promotions that forced them to discount their products. Ms. Plonski contends that 1-800 Radiator had told them they had several parties interested in buying their business. Instead of helping them sell their business, Plonski claims 1-800-Radiator made a deal with a competitor (Performance Radiator) to take over the Plonski’s telephone number and exclusive territory. My husband and I purchased a 1-800 Radiator franchise in April 2007. We borrowed and leveraged all of our financial resources to purchase this Franchise for $200,000 including our inventory. In addition, we had to have a cash injection of $50,000. So the total was $250,000. I realized in the first 2 weeks that we would never make a dime. The Franchisor continued to throw promotion after promotion, discounting our sales up to 25% and besides their 10% off the top of our gross sales, they charged erroneous phone call fees called rollover sales. sales calls that we had no control of the rollover process. They made the accounting very confusing even for the top notched CPA’s that we hired with years of experience with franchises. At one point I calculated over 25% of our gross sales being paid to the Franchisor out of our checking account which the franchise agreement required full access to take money out whenever they pleased. Our original franchise agreement stated “no quota on sales” yet they harassed us for documented sales visits. All a ploy in the end to sell our franchise, customer base and everything we worked for and forced us into bankruptcy. We offered our business for sale, and they led us on for several months, stating they had 5 interested parties in buying our business. We then get a call on Friday Dec 19, 2014 that none of the deals went through. That night, our main phone number was then forwarded to [a competitor,] Performance Radiator. We made some inquiries and found out that not only did they sell our number, they sold our territory with a non compete clause. Now, no 1-800 Radiator franchise in bordering states can service our territory in the state of New Mexico. All of the calls roll over to Performance Radiator. Not only our local phone number but the main Franchisor’s toll free number now rolls over to Performance Radiator. 1-800 Radiator stole our franchise, stole our territory that we built, and we got nothing. Now we are stuck with inventory we can not sell and an SBA loan that we borrowed $200,000 for this business. In my opinion, the 1-800 Radiator franchisor who is actually called Radiator Express Warehouse, Inc. from Benicia, Ca are crooks and they have forced us into bankruptcy. If you own a franchise or contemplating doing business with these people, don’t! If they did it to us, they will do it to anyone. ARE YOU FAMILIAR WITH THE 1-800-RADIATOR & AC FRANCHISE OPPORTUNITY? SHARE A COMMENT BELOW. if you want to hear how 1 800 radiators deceiving potential buyers contact me!!! !